A total of four types are available: three types with the same dimensions but different load torques and one type with specifications and dimensions matched to compact servo motors 40, 60, and 80. Select the one that best matches your application and life cycle. 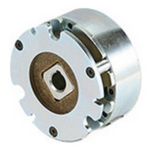 All types satisfy the rated torque values from the initial use, so the customer does not need to break them in.